The Korean War was the first militarized instance of containment, as U.S. and South Korea fought against communist North Korea. In June 1950, North Korean troops surged across the border into South Korea, triggering the first major confrontation between the forces of the communist and non-communist worlds. The Korean War was the first time the policy of containment spread outside the initial Asian defense perimeter as defined by the U.S. Secretary of State. The success of the Inchon landing inspired the U.S. and the United Nations to adopt a rollback strategy to overthrow the Communist North Korean regime, which was later revoked after the Chinese Army intervened. The cease-fire armistice that resulted from the Korean conflict divided Korea into a Communist northern state and a republican southern state, with a demilitarized zone between the two territories that remains to this day. Currently, American troops are still stationed in South Korea. Douglas MacArthur: An American army general and field marshal of the Philippine Army who was Chief of Staff of the United States Army during the 1930s and played a prominent role in the Pacific theater during World War II. He led the U.N. forces during the Korean War. Containment was the major Cold War policy of the United States and its allies to prevent the spread of communism abroad. This policy was a response to a series of moves by the Soviet Union to enlarge communist influence in Eastern Europe, China, Korea, Africa, and Vietnam. Containment represented a middle-ground position between detente (the easing of strained political relations) and rollback (forcing change in the major policies of a state, usually by replacing its ruling regime). It lets the opponent choose the place and time of any confrontation. During the Cold War it meant intervening to prevent the spread of Communism to new countries but not attacking nations that were already Communist. In line with this policy, the U.S. attempted to curb Soviet influence on the Korean Peninsula by occupying the southern part of that area. The area occupied by the U.S. became South Korea, while the other part became North Korea. North Korea soon passed into the control of the Communist Party. In May 1949, fighting between North and South Korean troops broke out near the border between the two nations. In an attempt to add South Korea to the Communist World, North Korea invaded South Korea in 1950. The People’s Republic of China and the Soviet Union lent their support to North Korea, while the United States did the same to South Korea. On June 25, 1950, a large military force moved across the 38th parallel in the Republic of Korea. On Saturday, June 24, 1950, U.S. Secretary of State Dean Acheson informed President Truman by telephone, “Mr. President, I have very serious news. The North Koreans have invaded South Korea.” Truman and Acheson discussed a U.S. invasion response with defense department principals, who agreed that the United States was obligated to repel military aggression. They likened the situation to Adolf Hitler’s aggressions in the 1930s, and said that the mistake of appeasement must not be repeated. In his autobiography, President Truman acknowledged that fighting the invasion was essential to the American goal of the global containment of communism as outlined in the National Security Council Report 68 (NSC-68). The Korean War was the first militarized instance of containment, as U.S. and South Korea fought against communist North Korea. On June 27, 1950, the United Nations Security Council first adopted a ceasefire resolution. When the UN Security Council voted to aid South Korea in stopping North Korean aggression, the U.S. agreed to send troops to the Korean Peninsula. General Douglas MacArthur was given the command of UN troops in Korea. The U.S. agreed to send troops over on June 30 along with increasing aid to the French fight against Communists rebels in Indochina. MacArthur was placed in command on July 8. At the beginning the U.S. troops lacked training and were out of shape. In the first few weeks of fighting, the U.S. troops were pushed back to a defensive perimeter at Pusan. Incheon: US success at Incheon encouraged UN and US forces to pursue a policy of rollback in Korea. 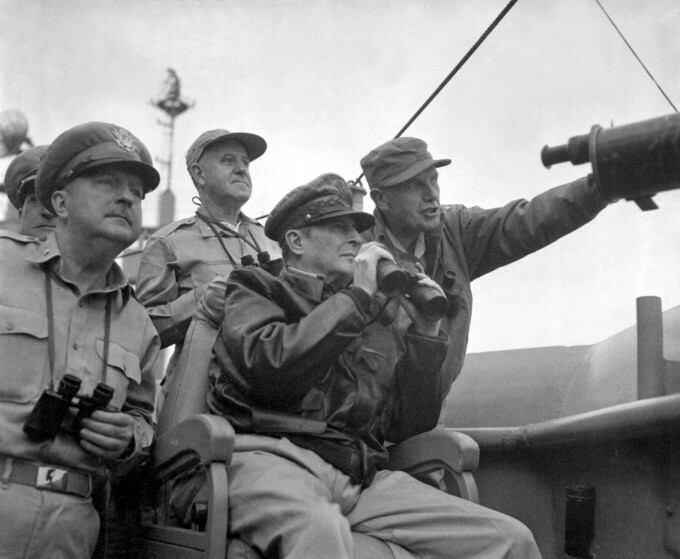 This photograph depicts General MacArthur observing the Incheon Landing. Chinese forces enter Korea: Chinese forces crossed the Yalu River and joined the Korean War. Chinese entrance into the War prolonged the conflict and increased tensions between the U.S. and China. While not directly committing forces to the conflict, the Soviet Union provided material aid to both the North Korean and Chinese armies. The fighting ended on July 27, 1953, when the armistice agreement was signed. The agreement restored the border between the Koreas near the 38th Parallel and created the Korean Demilitarized Zone (DMZ), a 2.5-mile-wide fortified buffer zone between the two Korean nations. Minor incidents still continue today. The Korean War was one of the most significant events of the Cold War, caused largely by the broader tensions between America and the Soviet Union. The Korean War was primarily the result of the political division of Korea by an agreement of the victorious Allies at the conclusion of the Pacific War at the end of World War II. In June 1950, the Soviet and Chinese backed North Korean People’s Army invaded South Korea. The UN responded by coming to the aid of South Korea, led mainly by the United States. In September 1950, the U.S. military led a successful attack on North Korea, which led to China sending troops to support the North Korean Army. Eventually, after an intense war of attrition, an armistice was signed that created a demilitarized zone between North and South Korea; however, no peace treaty was ever signed and the war continues to this day. During the main years of fighting, approximately 1.2 million people died on all sides of the conflict. 38th parallel: This latitudinal parallel divides the Korean peninsula roughly in the middle. In 1948, this parallel became the boundary between the Democratic People’s Republic of Korea (North Korea) and the Republic of Korea (South Korea), both of which claim to be the government of the whole of Korea. war of attrition: A military strategy in which a belligerent attempts to win a war by wearing down the enemy to the point of collapse through continuous losses in personnel and materiel. Joseph Stalin: The leader of the Soviet Union from the mid-1920s until his death in 1953. The Korean War began when North Korea invaded South Korea in 1950. The United Nations, with the United States as the principal force, came to the aid of South Korea. China, with assistance from the Soviet Union, came to the aid of North Korea. The war arose from the division of Korea at the end of World War II and from the global tensions of the Cold War that developed immediately afterwards. Korea was ruled by Japan from 1910 until the closing days of World War II. In August 1945, the Soviet Union declared war on Japan as a result of an agreement with the United States and liberated Korea north of the 38th parallel. U.S. forces subsequently moved into the south. By 1948, as a product of the Cold War between the Soviet Union and the United States, Korea was split in to two separate governments. Both claimed to be the legitimate government of Korea, and neither side accepted the border as permanent. The civil war escalated into open warfare when North Korean forces—supported by the Soviet Union and China—moved to the south to unite the country on June 25, 1950. On that day, the United Nations Security Council recognized this North Korean act as invasion and called for an immediate ceasefire. Twenty-one countries of the United Nations eventually contributed to the defense of South Korea, with the United States providing 88% of the UN’s military personnel. On the North Korean side, Joseph Stalin “planned, prepared, and initiated” the invasion, creating “detailed [war] plans” that were communicated to the North Koreans. After the first two months of the conflict, South Korean forces were on the point of defeat, forced back to the Pusan Perimeter. In September 1950, an amphibious UN counter-offensive was launched at Inchon and cut off many of the North Korean attackers. Those that escaped envelopment and capture were rapidly forced back north all the way to the border with China at the Yalu River, or into the mountainous interior. At this point, in October 1950, Chinese forces crossed the Yalu and entered the war. Chinese intervention triggered a retreat of UN forces that continued until mid-1951. After these dramatic reversals of fortune, which saw Seoul change hands four times, the last two years of conflict became a war of attrition, with the front line close to the 38th parallel. The war in the air, however, was never a stalemate. North Korea was subject to a massive bombing campaign. Jet fighters confronted each other in air-to-air combat for the first time in history, and Soviet pilots covertly flew in defense of their Communist allies. As a result of early Chinese tactical successes, General Douglas MacArthur, who was in command of U.N. forces in Korea, argued in favor of using nuclear weapons against China and/or the North Korean interior in order to disrupt Chinese supply lines and force negotiations. MacArthur attempted to orchestrate public support for bombing China and assisting an invasion of the mainland by KMT forces led by Chiang Kai-shek. MacArthur’s stance contributed to his controversial dismissal by President Truman. In April 1951, Truman relieved MacArthur of his duties and replaced him with Ridgway. The fighting ended on July 27, 1953, when an armistice was signed. The agreement created the Korean Demilitarized Zone to separate North and South Korea and allowed the return of prisoners. However, no peace treaty has been signed, and the two Koreas are technically still at war. Periodic clashes, many deadly, have continued to the present. The Truman administration was unprepared for the invasion. Korea was not included in the strategic Asian Defense Perimeter outlined by Secretary of State Dean Acheson. Military strategists were more concerned with the security of Europe against the Soviet Union than East Asia. At the same time, the Administration was worried that a war in Korea could quickly widen into another world war should the Chinese or Soviets decide to get involved. A major consideration was the possible Soviet reaction in the event of U.S. intervention. The Truman administration was fretful that a war in Korea was a diversionary assault that would escalate to a general war in Europe once the United States committed in Korea. At the same time, “[t]here was no suggestion from anyone that the United Nations or the United States could back away from [the conflict].” Truman believed if aggression went unchecked, a chain reaction would be initiated that would marginalize the United Nations and encourage Communist aggression elsewhere. The Truman administration was still uncertain if the attack was a ploy by the Soviet Union or just a test of U.S. resolve. The decision to commit ground troops became viable when a communiqué was received on June 27 indicating the Soviet Union would not move against U.S. forces in Korea. The Truman administration now believed it could intervene in Korea without undermining its commitments elsewhere. According to the data from the U.S. Department of Defense, the United States suffered 33,686 battle deaths and 2,830 non-battle deaths during the Korean War. U.S. battle deaths were 8,516 before its first engagement with the Chinese on November 1, 1950. South Korea reported 373,599 civilian and 137,899 military deaths. Western sources estimate the PVA suffered about 400,000 killed and 486,000 wounded, while the KPA suffered 215,000 killed and 303,000 wounded. Data from official Chinese sources, on the other hand, reported that the PVA had suffered 114,000 battle deaths, 34,000 non-battle deaths, 340,000 wounded, 7,600 missing, and 21,400 captured during the war. Among those captured, about 14,000 defected to Taiwan, while the other 7,110 were repatriated to China. Chinese sources also reported that North Korea suffered 290,000 casualties, 90,000 captured and a “large” number of civilian deaths. Postwar recovery was different in the two Koreas. South Korea stagnated in the first postwar decade. In 1953, South Korea and the United States concluded a Mutual Defense Treaty. In 1960, the April Revolution occurred and students joined an anti-Syngman Rhee demonstration; 142 were killed by police, leading Rhee to resign and flee to the United States. From 1965 to 1973, South Korea dispatched troops to Vietnam and received $235,560,000 allowance and military procurement from the U.S. GNP increased five-fold during the Vietnam War. South Korea industrialized and modernized. Contemporary North Korea remains underdeveloped. South Korea had one of the world’s fastest-growing economies from the early 1960s to the late 1990s. Following extensive USAF bombing, North Korea “had been virtually destroyed as an industrial society.” After the armistice, Kim Il-Sung requested Soviet economic and industrial assistance. In September 1953, the Soviet government agreed to “cancel or postpone repayment for all… outstanding debts,” and promised to grant North Korea one billion rubles in monetary aid, industrial equipment, and consumer goods. Eastern European members of the Soviet Bloc also contributed with “logistical support, technical aid, [and] medical supplies.” China cancelled North Korea’s war debts, provided 800 million yuan, promised trade cooperation, and sent in thousands of troops to rebuild damaged infrastructure. Postwar, about 100,000 North Koreans were executed in purges. According to Rummel, forced labor and concentration camps were responsible for over one million deaths in North Korea from 1945 to 1987; others have estimated 400,000 deaths in concentration camps alone. Estimates based on the most recent North Korean census suggest that 240,000 to 420,000 people died as a result of the 1990s North Korean famine and that there were 600,000 to 850,000 unnatural deaths in North Korea from 1993 to 2008. The North Korean government has been accused of “crimes against humanity” for its alleged culpability in creating and prolonging the 1990s famine. South Korean anti-Americanism after the war was fueled by the presence and behavior of American military personnel (USFK) and U.S. support for the authoritarian regime, a fact still evident during the country’s democratic transition in the 1980s. However, anti-Americanism has declined significantly in South Korea in recent years, from 46% favorable in 2003 to 74% favorable in 2011, making South Korea one of the most pro-American countries in the world. 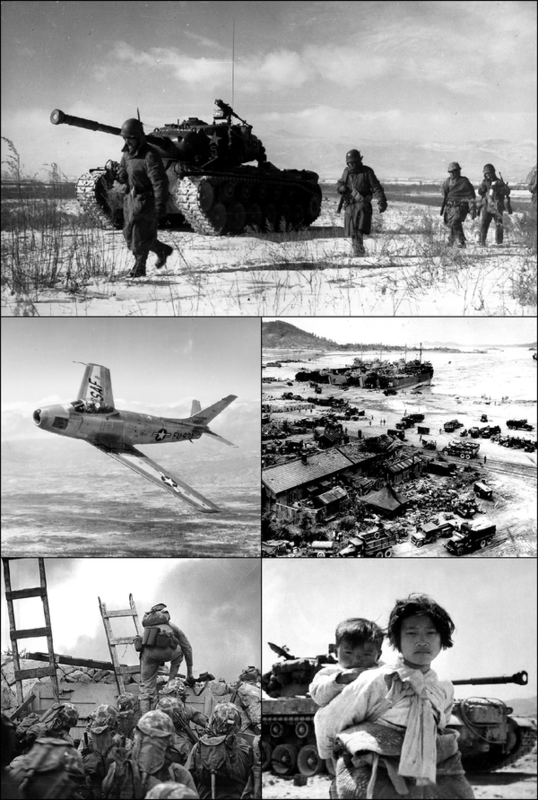 Korean War Montage: Clockwise from top: A column of the U.S. 1st Marine Division’s infantry and armor moves through Chinese lines during their breakout from the Chosin Reservoir; UN landing at Incheon harbor, starting point of the Battle of Incheon; Korean refugees in front of an American M26 Pershing tank; U.S. Marines, led by First Lieutenant Baldomero Lopez, landing at Incheon; F-86 Sabre fighter aircraft. An armistice ceasefire in 1953 ended fighting in Korea and established a buffer zone between North and South Korea, but tensions remain. The need for an armistice agreement in Korea was informed by the territorial stalemate established by July 1951, the heavy destruction inflicted during the war, and the increasing U.S. desire to extract itself from the conflict. Though an armistice ceasefire was agreed upon, tensions remain along their shared border, and the two nations are technically still in a state of war. The demilitarized zone along the North and South Korean border was conceived as a buffer between the two countries to safeguard against future hostilities, though a number of North Korean incursions have been attempted since the armistice has been established. The Korean War resulted in the loss of over 60,000 U.S. and U.N. soldiers, with millions of Chinese and North Korean soldiers and Korean civilians perishing as well. The Korean War was the first use of the Truman Doctrine ‘s policy of containment. It resulted in greater tensions between the U.S. and China, and further divided the U.S. and the Soviet Union. Truman Doctrine: The American policy in 1947 of providing economic and military aid to Greece and Turkey because they were threatened by communism. It was the start of the containment policy to stop Soviet expansion and a major step in beginning the Cold War. Korean demilitarized zone (DMZ): This strip of land separates North Korea and South Korea. It was created as part of the Korean Armistice Agreement between North Korean, People’s Republic of China, and United Nations Command forces in 1953. The 38th parallel north—which divides the Korean Peninsula roughly in half—was the original boundary between the United States and Soviet Union’s brief administration areas of Korea at the end of World War II. Upon the creation of the Democratic People’s Republic of Korea (DPRK, informally North Korea) and the Republic of Korea (ROK, informally South Korea) in 1948, it became a de facto international border and one of the most tense fronts in the Cold War. Both the North and the South remained dependent on their sponsor states from 1948 to the outbreak of the Korean War. That conflict, which claimed more than three million lives and divided the Korean Peninsula along ideological lines, commenced on June 25, 1950, with a full-front DPRK invasion across the 38th parallel. It ended in 1953 after international intervention pushed the front of the war back to near the 38th parallel. After North Korean forces invaded South Korea in 1950, it only took two months for the South Korean and UN forces to be pushed back to a small area in the south. A rapid U.N. counter-offensive then drove the North Koreans past the 38th Parallel and almost to the Yalu River, when China entered the war on the side of North Korea. Chinese intervention forced the Southern-allied forces to retreat behind the 38th Parallel. The changes in territory stopped there, with both sides in their original positions near the 38th Parallel. For the rest of the war, both sides were dug in trenches and no side appeared to be winning. Almost as many bombs as were dropped on Germany during the whole of World War II were dropped on the cities in North Korea. The need for an armistice agreement in Korea was informed by this territorial stalemate established by July 1951, the heavy destruction inflicted during the war, and the increasing U.S. desire to extract itself from the conflict. Peace negotiations started on July 10, 1950, but a ceasefire was not reached until 1953. The fighting ended on July 27, 1953, when the armistice agreement was signed, restoring the border between the Koreas near the 38th Parallel. It was agreed that a buffer zone, called the Korean demilitarized zone (DMZ), would be built between North and South Korea, running from the northeast of the 38th parallel to the southwest. It still stands as the most heavily defended border in the world, defended by South Korean/U.S. troops on one side and North Korean troops on the other. No peace treaty was signed between North and South—just a ceasefire—so technically they are still in a state of war. Owing to this theoretical stalemate, and genuine hostility between the North and the South, large numbers of troops are still stationed along both sides of the line, each side guarding against potential aggression from the other side. The armistice agreement explains exactly how many military personnel and what kind of weapons are allowed in the DMZ. Soldiers from both sides may patrol inside the DMZ, but they may not cross the MDL; ROK soldiers, however heavily armed, patrol as military police and have memorized each line of the armistice. Sporadic outbreaks of violence have killed more than 500 South Korean soldiers, 50 U.S. soldiers, and 250 soldiers from DPRK along the DMZ between 1953 and 1999. 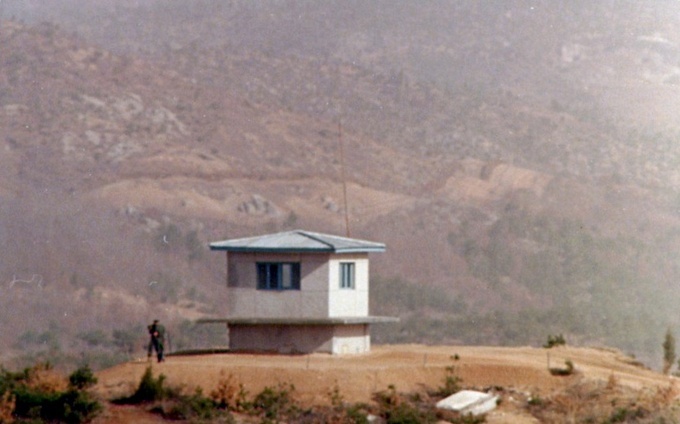 North Korea DMZ: A portion of the North Korean DMZ seen from the Joint Security Area in January 1976. This border is one of the most heavily fortified in the world. 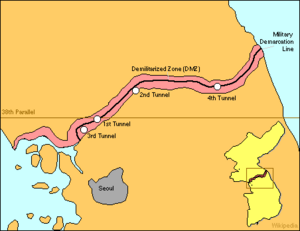 Korean Outcome: A map of the Demilitarized Zone, established by the 1953 armistice agreement that ended the Korean War. The U.S. lost about 54,000 troops in the conflict and another 7,000 U.N. troops were killed. The casualty figures were even higher for the Chinese/North Koreans—an estimated 2 million to 4 million were killed or wounded. Millions more Korean civilians died. The Korean war was the first time the Truman Doctrine, the containment of the spread of communism, was put into action. It was also the first ever time that the U.N. undertook a military operation. The war had mixed effects—it sent a clear message that the West would not tolerate any threat to its allies or sphere of influence no matter how far away they were on the map, and was prepared to defend it using force if necessary. However, engaging in the Korean War also resulted in the U.S. making even more enemies (this time with China and North Korea), and doomed already strained relations with the Soviet Union. “McCarthyism” is a term arising from the paranoia of the Second Red Scare in the United States from 1950-54, which was fed by Joseph McCarthy, a U.S. senator from Wisconsin. Beginning in 1950, Joseph McCarthy used his position as a U.S. senator to make often sensational accusations of Communist infiltration into the State Department, the administration of President Harry S. Truman, and the United States Army. McCarthyism is the practice of making accusations of disloyalty, subversion, or treason without proper evidence. During the McCarthy era, thousands of Americans were accused of being communists or communist sympathizers. They became the subject of aggressive investigations and questioning before government or private-industry panels, committees, and agencies. Senator McCarthy attempted to accuse the U.S. Army of anti-U.S. leanings in televised hearings, but Army lawyer Joseph Welch accused the Senator of being shameless and dishonorable as spectators applauded. Due to the largely reckless and disgraceful nature of the McCarthy movement and the number of innocent individuals whose lives it derailed, the term “McCarthyism” has a pejorative tone, and the Second Red Scare is generally regarded as a dark period in domestic American politics. Second Red Scare: This event occurred after World War II (1939–45), and was popularly known as “McCarthyism” after its most famous supporter and namesake, Senator Joseph McCarthy. McCarthyism coincided with increased popular fear of communist espionage consequent to a Soviet Eastern Europe, the Berlin Blockade (1948–49), the Chinese Civil War, the confessions of spying for the Soviet Union given by several high-ranking U.S. government officials, and the Korean War. McCarthyism: The intense opposition, countering, fear, and/or suspicion of Communism, particularly in the United States during the 1950s led by Senator Joseph McCarthy of Wisconsin. The historical period that came to be known as the McCarthy era began well before Joseph McCarthy’s involvement. Many factors contributed to McCarthyism, some extending back to the years of the First Red Scare (1917–20), inspired by Communism ‘s emergence as a recognized political force. Thanks in part to its success in organizing labor unions and its early opposition to fascism, the Communist Party of the United States (CPUSA) increased its membership through the 1930s, reaching a peak of about 75,000 members in 1940-41. While the United States was engaged in World War II and allied with the Soviet Union, the issue of anti-communism was largely muted. With the end of World War II, the Cold War began almost immediately, as the Soviet Union installed Communist puppet régimes across Central and Eastern Europe while the United States backed anti-communist forces in Greece and China. Events in 1949 and 1950 sharply increased the sense of threat from Communism in the United States. The Soviet Union tested an atomic bomb in 1949, earlier than many analysts had expected. That same year, Mao Zedong ‘s Communist army gained control of mainland China despite heavy American financial support of the opposing Kuomintang. In 1950, the Korean War began, pitting U.S., U.N., and South Korean forces against Communists from North Korea and China. The following year saw several significant developments in Soviet Cold War espionage activities. More subtle forces also encouraged the rise of McCarthyism. It was long a practice of conservative politicians to refer to progressive reforms such as child labor laws and women’s suffrage as “Communist” or “Red plots.” This tendency increased in the 1930s in reaction to the New Deal policies of President Franklin D. Roosevelt. Many conservatives equated the New Deal with socialism or Communism, and saw its policies as evidence that the government had been heavily influenced by Communist policy-makers in the Roosevelt administration. In general, the vaguely defined danger of “Communist influence” was a more common theme in the rhetoric of anti-Communist politicians than espionage or any other specific activity. Senator Joseph McCarthy: A photo of Sen. Joseph McCarthy. McCarthyism is the practice of making accusations of disloyalty, subversion, or treason without proper evidence. The term has its origins in the period in the United States known as the Second Red Scare, lasting roughly from 1950 to 1956 and characterized by heightened fears of communist influence on American institutions and espionage by Soviet agents. Originally coined to criticize the anti-communist pursuits of Republican U.S. Senator Joseph McCarthy of Wisconsin, “McCarthyism” soon took on a broader meaning, describing the excesses of similar efforts. The term is now used more generally to describe reckless, unsubstantiated accusations, demagogic attacks on the character, or patriotism of political adversaries. While Communism was expanding across Europe and Asia, the United States entered an era of paranoia known as the Red Scare. Joseph McCarthy, Republican senator from Wisconsin, gained sudden prominence for his dramatic accusations of Communist espionage and influence inside the U.S. government. Beginning with a dramatic speech in 1950 from Wheeling, West Virginia, McCarthy used his position to make often sensational accusations of Communist infiltration into the State Department, the Democratic administration of President Harry S. Truman, and the United States Army. During that speech, he produced a piece of paper which he claimed contained a list of known Communists working for the State Department. McCarthy is usually quoted as saying: “I have here in my hand a list of 205—a list of names that were made known to the Secretary of State as being members of the Communist Party and who nevertheless are still working and shaping policy in the State Department.” This speech resulted in a flood of press attention to McCarthy and established the path that made him one of the most recognized politicians in the United States. During the McCarthy era, thousands of Americans were accused of being Communists or Communist sympathizers and became the subject of aggressive investigations and questioning before government or private-industry panels, committees, and agencies. The primary targets of such suspicions were government employees, homosexuals, those in the entertainment industry, educators, and union activists. Suspicions were often given credence despite inconclusive or questionable evidence, and the level of threat posed by a person’s real or supposed leftist associations or beliefs was often greatly exaggerated. Many people suffered loss of employment and/or destruction of their careers; some even suffered imprisonment. Most of these punishments came about through trial verdicts later overturned, laws that would be declared unconstitutional, dismissals for reasons later declared illegal or actionable, or extra-legal procedures that would come into general disrepute. In the film industry, more than 300 actors, authors, and directors were denied work in the U.S. through the unofficial Hollywood blacklist. Blacklists were at work throughout the entertainment industry, in universities and schools at all levels, in the legal profession, and in many other fields. A port security program initiated by the Coast Guard shortly after the start of the Korean War required a review of every maritime worker who loaded or worked aboard any American ship, regardless of cargo or destination. As with other loyalty-security reviews of McCarthyism, the identities of accusers and even the nature of accusations were typically kept secret from the accused. Nearly 3,000 seamen and longshoremen lost their jobs due to this program alone. 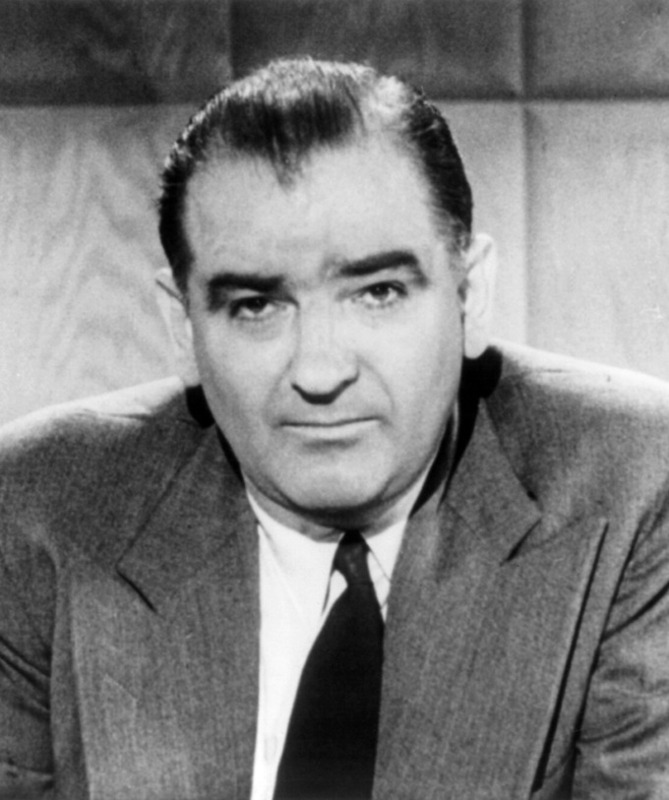 McCarthyism began to lose its potency as the perceived threat of Communism receded during the latter half of the 1950s, even as McCarthy and others overreached politically. Arguably, the movement’s most dramatic loss of credibility came when Senator McCarthy attempted to accuse the U.S. Army of anti-U.S. leanings. In televised hearings, Army lawyer Joseph Welch accused the Senator of being shameless and dishonorable as spectators applauded. 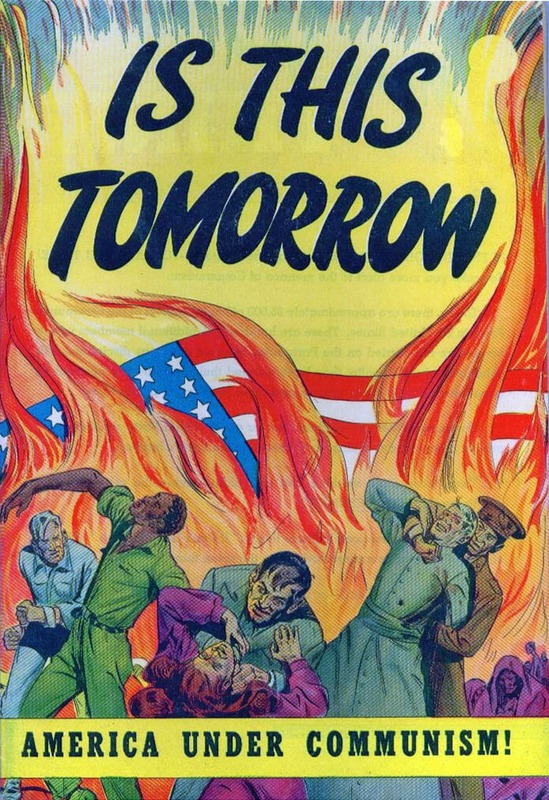 Is This Tomorrow: A 1947 propaganda comic book raising the specter of a Communist takeover. McCarthy played on Communist fears in the U.S. during the Second Red Scare. The 1952 Presidential election hinged on the issues of Korea, Communism, and corruption. Unpopular incumbent President Harry S. Truman decided not to run, so the Democratic Party instead nominated Governor Adlai Stevenson II of Illinois. Stevenson had gained a reputation in Illinois as an intellectual and eloquent orator. The Republican Party countered with popular war hero General Dwight D. Eisenhower and won in a landslide, ending 20 consecutive years of Democratic control of the White House. stalemate: The state in which combatants cannot advance, resulting in a draw. Communism: A revolutionary socialist movement to create a classless, moneyless, and stateless social order structured upon common ownership of the means of production, as well as a social, political and economic ideology that aims at the establishment of this social order. This movement, in its Marxist-Leninist interpretations, significantly influenced the history of the 20th century, which saw intense rivalry between the “socialist world” (socialist states ruled by communist parties) and the “western world” (countries with capitalist economies). The United States presidential election of 1952 was the 42nd presidential election. Cold War tension between the United States and the Soviet Union was at its peak. In the United States Senate, Republican Senator Joseph McCarthy of Wisconsin had become a national figure after chairing congressional investigations into the issue of Communist spies within the U.S. government. McCarthy’s so-called “witch hunt,” combined with national tension and weariness after two years of bloody stalemate in the Korean War, the Communist Revolution in China, the 1949 Soviet acquisition of nuclear weapons, and the early-1950s economic recession, set the stage for a hotly contested presidential race. Incumbent President Harry S. Truman, who as early as 1950 had decided not to run, decided to back current Illinois Governor Adlai Stevenson. As in 1948, President Truman reached out to General Dwight D. Eisenhower to see if he had interest in heading the Democratic ticket. Eisenhower demurred at the time and then wound up heading the Republican ticket. The Democratic Party instead nominated Governor Adlai Stevenson of Illinois. Stevenson had gained a reputation in Illinois as an intellectual and eloquent orator, but had vacillated a great deal on whether he even wanted to run for the presidency. President Truman had several meetings with Stevenson about the his desire for Stevenson to become the standard bearer for the party. Truman became very frustrated with Stevenson and his indecision before committing to run. The Republican Party saw a contest between the internationalist and isolationist perspectives. Senator Robert A. Taft said that isolationism was dead, but saw little role for the United States in the Cold War. Eisenhower, the NATO commander and war hero, narrowly defeated Taft, then crusaded against the Truman policies he blasted as “Korea, Communism and Corruption.” Ike, as they called him, did well in all major demographic and regional groups outside the Deep South. Eisenhower won in a landslide, ending 20 consecutive years of Democratic control of the White House. The Eisenhower campaign was one of the first presidential campaigns to make a major, concerted effort to win the female vote. Many of his radio and television commercials discussed topics such as education, inflation, ending the war in Korea, and other issues thought to appeal to women. The Eisenhower campaign made extensive use of female campaign workers who made phone calls to likely Eisenhower voters, distributed “Ike” buttons and leaflets, and gave parties to build support for the GOP ticket in their neighborhoods. On election day, Eisenhower won a solid majority of the female vote. Eisenhower campaigned by attacking “Korea, Communism, and Corruption”—that is, what the Republicans regarded as the failures of the outgoing Truman administration to deal with these issues. The campaign accused the administration of neglecting Latin America and thus leading them into the arms of wily Communist agents waiting to exploit local misery and capitalize on any opening to communize America. Charges that Soviet spies had infiltrated the government plagued the Truman Administration and became a major campaign issue for Eisenhower. The Republicans blamed the Democrats for the military’s failure to be fully prepared to fight in Korea, accused the Democrats of “harboring” Communist spies within the federal government, and blasted the Truman Administration for the numbers of officials who had been accused of various crimes. In return, the Democrats criticized Senator Joseph McCarthy and other Republican conservatives as “fearmongers” who were recklessly trampling on the civil liberties of government employees. Despite these mishaps, Eisenhower retained his enormous personal popularity from his leading role in World War II, and huge crowds turned out to see him around the nation. His campaign slogan, “I Like Ike,” was one of the most popular in American history. Stevenson concentrated on giving a series of thoughtful speeches around the nation; he too drew large crowds. Although his style thrilled intellectuals and academics, some political experts wondered if he were speaking “over the heads” of most of his listeners and dubbed him an “egghead,” based on his baldness and intellectual demeanor. Eisenhower maintained a comfortable lead in the polls throughout most of the campaign. On election day, Eisenhower won a decisive victory, receiving more than 55% of the popular vote and carrying 39 of the 48 states. He took three Southern states that the Republicans had won only once since Reconstruction: Virginia, Florida, and Texas. This election was the first in which a computer (the UNIVAC I) was used to predict the results.